Each month our team nominates a patient of the month. Stanley is our patient of the month for March. 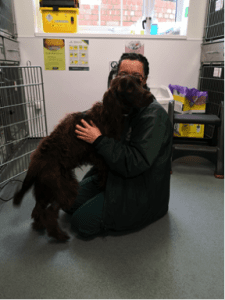 Stanley was referred to the Internal Medicine department at Davies Veterinary Specialists for investigations into an increased respiratory rate, vomiting and an elevated body temperature. A CT of his chest was performed which demonstrated severe, diffuse changes affecting both lungs. These changes were most consistent with pneumonia (either secondary to a bacterial infection or lungworm). An airway wash was performed which confirmed that Stanley had a bacterial pneumonia. Initially, Stanley responded very well to antibiotics and pain killers and was discharged. However, his clinical signs relapsed after a couple of days at home and he re-presented to Davies. A clinical examination identified that his fever had returned and he was now struggling to breathe. He also appeared to be in considerable pain when walking. His joints were very sore, warm and swollen. We were concerned that Stanley now had an immune mediated polyarthritis (where the immune system starts to attack the synovial joints in the body), secondary to the pneumonia and on-going inflammation in his lungs. Stanley was hospitalised and intensive treatments were re-instituted. A conscious chest x-ray was taken which demonstrated that Stanley, once again, had severe pneumonia, but on this occasion also had an abnormal dilation of his oesophagus. We were concerned that Stanley’s abnormal oesophagus could be preventing food from passing down into his stomach as normal. In this case, food is then retained in the oesophagus and can passively reflux into the throat. If Stanley breathes in as the food re-enters his throat the food material gets aspirated into the lungs and sets up a pneumonia. We started feeding Stanley in an upright position, he was then held upright for 15-20 minutes after each meal. Stanley’s recovery was slow, but he made gradual improvements. The polyarthritis gradually resolved without specific treatments. Stanley had a long course of antibiotics and did not have another relapse. 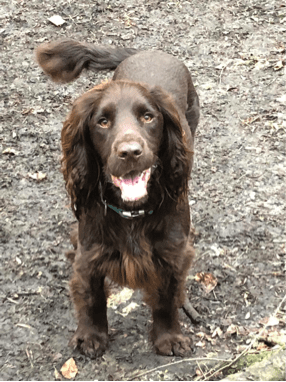 Stanley has continued to improve since discharge, he is now back to enjoying his walks and back to running around like a crazy Spaniel! His owners are continuing to feed him in an upright position to prevent this from happening again. Our Nursing team nominated Stanley for ‘Patient of the Month’ because, even at his most poorly, he remained a co-operative and positive boy, overall a wonderful patient to treat.